William Amey was born in Duddeston in Birmingham in 1881. He joined the 1/8th Battalion the Royal Warwickshire Regiment in his mid-thirties during World War I. Lance Corporal Amey was 37 years old when he took part in the attack by the 75th Brigade on Landrecies in order to secure the bridgehead on the Sambre. The 1/8th Battalion, who were on the left flank met with stiff opposition near Faubourg Sayer. His citation reads "For most conspicuous bravery on the 4th November 1918 during the attack on Landrecies France, when owing to fog many hostile machine-gun nests were missed by the leading troops. On his own initiative he led his section against a machine gun nest, under heavy fire, drove the garrison into a neighbouring farm and finally captured about 50 prisoners and several machine guns. Later single-handed and under heavy fire, he attacked a machine-gun post in a farm-house, killed two of the garrison and drove the remainder into a cellar until assistance arrived. Subsequently, single-handed he rushed a strongly-held post, capturing 20 (30) prisoners. He displayed throughout the day the highest degree of valour and determination." His gallantry made the capture of Fauborg Sayer possible and meant that the Battalion reached their objective of the lock on the Canal. The 1/8th Battalion were then employed on salvage work in Cambrais until July 1919 and were demobilised at Birmingham on the 1st August 1919. 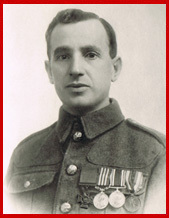 The Victoria Cross was presented to him by the King at Buckingham Palace on the 22nd February 1919. He was demobilised as a Corporal in 1919 and lived in Leamington Spa until his death at the age of 59.